Last year, Disney released a latex figure of Salacious Crumb that I was pretty impressed with. At $35, it wasn’t that expensive, plus it was nearly life sized and posable, so it could do double duty as a budget prop replica or even part of a Star Wars costume. I’ve had it displayed near my desk for more than a year and have gotten to like it pretty well. 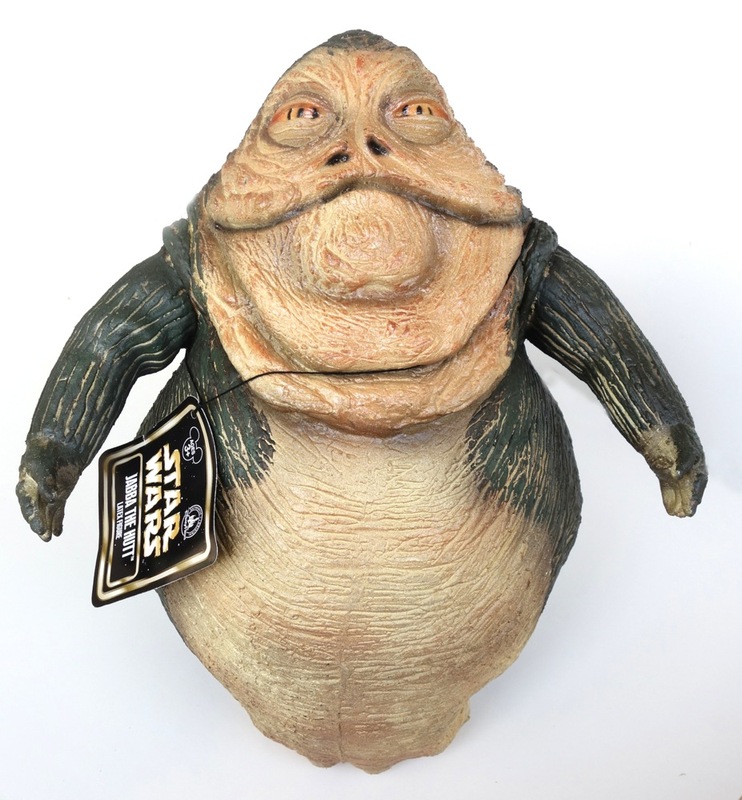 This year’s figure is Jabba himself, and while at $29.99 he’s $5 cheaper than Salacious was, I have a lot more trouble recommending him. Here they are together. He’s made of the same kind of latex material filled with polyester fiber as the Salacious Crumb figure. He may look kind of small above, and of course he’s not remotely life sized, but he is actually fairly large at around 2 feet long from head to tail. 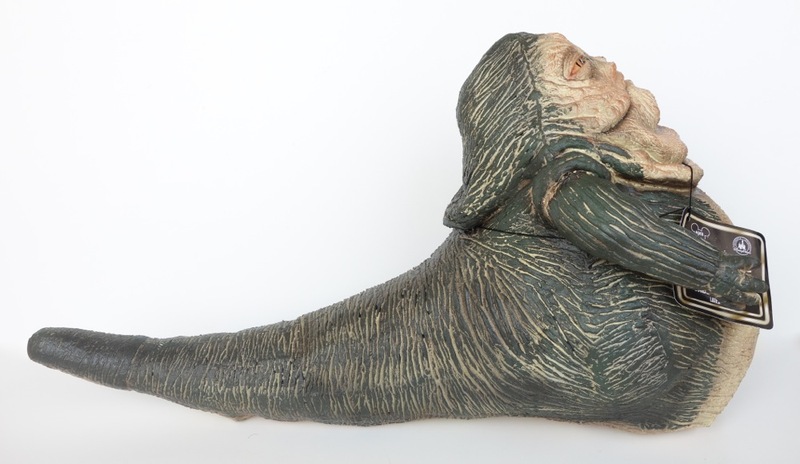 I’m not thrilled that they went with the prequel Jabba design, and making his tail stick out behind him like the POTF2 action figure just makes it seem awkward. He also appears to be bending backward to look at something above him, which contributes to the awkwardness of the pose. However, I must say that if you look at the figure from a reasonable distance, it looks pretty decent. It’s only when you pick it up and look at in detail when it starts to fall apart. There are apparently wires in his arms for posing, but it’s not really possible to do much with them, and even if you get it to hold a pose the latex folds unrealistically. There doesn’t appear to be a wire in the tail, so you have to have it sticking straight out behind him. There’s a very prominent label on the bottom that’s actually part of the sculpt, detailing the copyright information, etc. 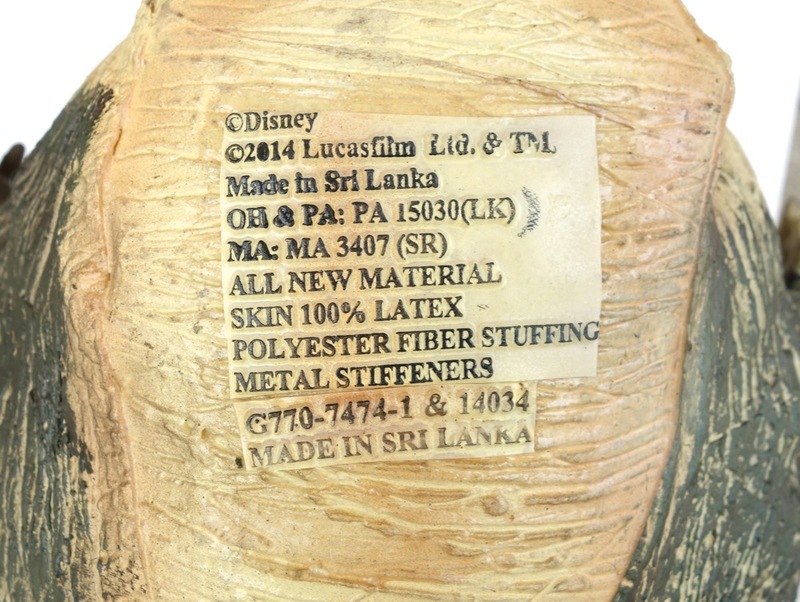 Interestingly, he was made in Sri Lanka rather than China, which I expected. 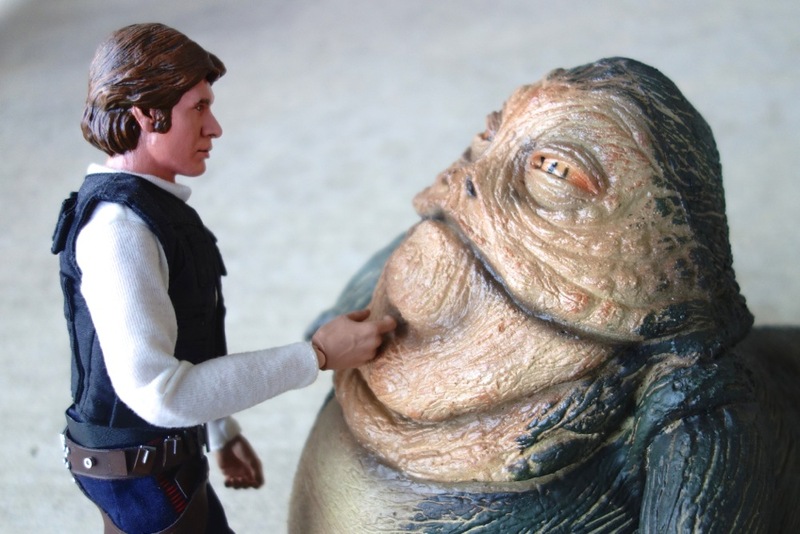 Probably the most interesting thing about him is that he’s the only thing close to a 1/6 scale prequel Jabba that we have. As I was writing this, I was inspired to break out my old (repainted) Sideshow smuggler Han Solo for a little photo shoot. 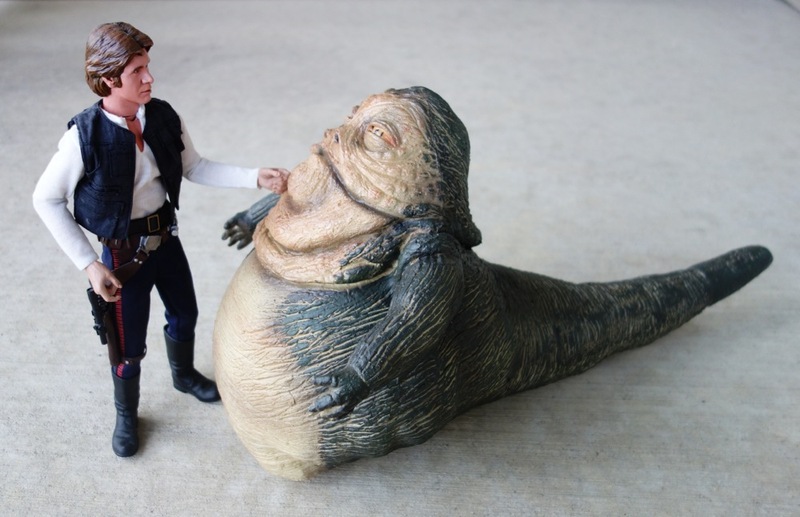 I’d say this Jabba might be a little on the small side, but it’s just about right. 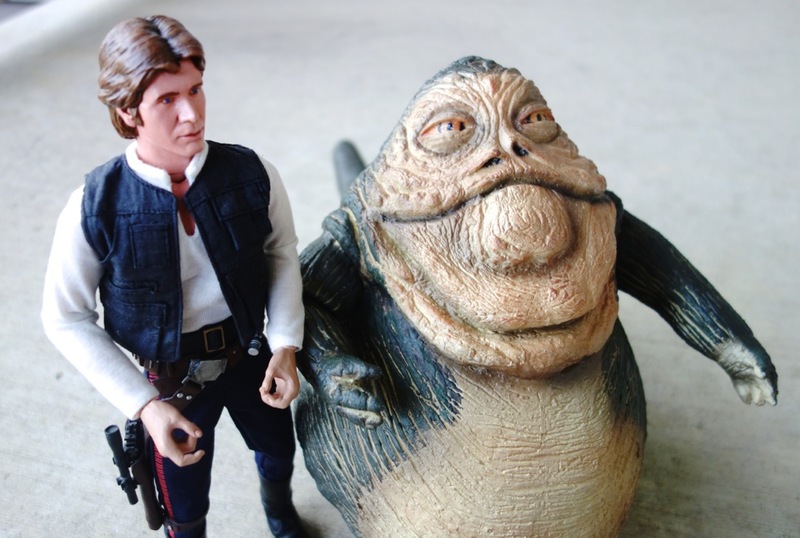 In fact, when paired with Han, his “looking up” pose makes sense.